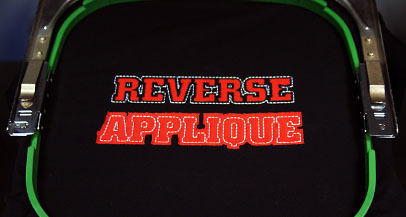 Laser cutting reverse appliqué - What is reverse appliqué? 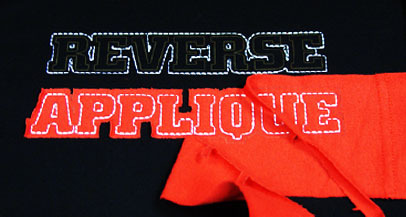 Reverse appliqué is a technique in the embroidery and textile industry which involves placing a piece of material or fabric on the inside of another fabric or garment like a t-shirt or a sweatshirt. The two fabrics are stitched together in your chosen design, the top layer of fabric is cut away with scissors along the inside of the stitching, exposing the second fabric underneath. Traditional appliqué is when a second piece of fabric is placed on top of a garment, stitched down and then the excess fabric is cut away from outside the stitching. Laser cutting reverse applique is an incredibly simple, fast and effective way to modernise traditional reverse applique methods without the time consuming use of scissors, hand cutting designs out of fabrics. Due to its speed over traditional methods the Apollo 600 is ideal for the mass production of laser cut reverse and normal appliques on any number of fabrics, materials and textiles. 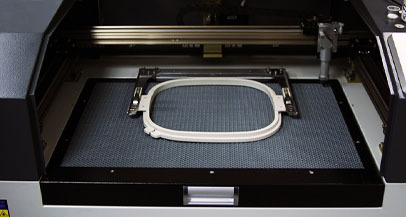 The Apollo 600 laser cutting and engraving machine has been developed specifically so that it can accommodate any shape or size of embroidery hoop and due to our bespoke software the Apollo can be calibrated for use with either single or multi head embroidery machines. 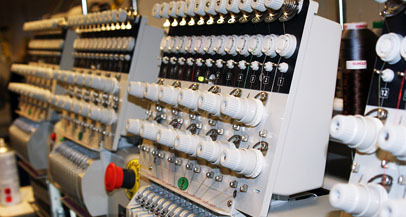 The precise and customisable controls make it possible to laser cut through the top layer of two stitched together pieces of fabric revealing the second making large quantities of reverse applique designs quickly and effectively.